I consider asphalt roofs to be one of the most practical and cost effective roof systems in use today. Firstly, once you sheath the roof framing of a building with 15mm tongue and groove plywood, you have an incredibly strong structure. This wooden membrane creates a strength to withstand greater earthquake and wind threats than other systems. During the building process the ply sheathing quickly secures the house against the weather so that the other trades can get in to advance the project. The heavy felt paper and shingles go on very quickly too. Shingles are about a metre wide and since they are flexible, curves and "cut up'" roof designs are dead easy. Depending on shingle model, warranties go from 30 to 100 years. If one needed to re-roof, it is a simple matter of putting another shingle roof right on top of the previous, at a fraction of the cost. They are so non-slippery and sturdy that you could just about have a game of rugby on them, (with harnesses of course). Asphalt roofs are non-reflective, quiet to outside noise such as torrential rain and air traffic and have a thermal rating to help insulate your house. Being non metallic they are not affected by industrial urban polution or salt spray. After corrugated iron, they are one of the cheapest roof systems on the market. No wonder about 70% of all North American homes have them. 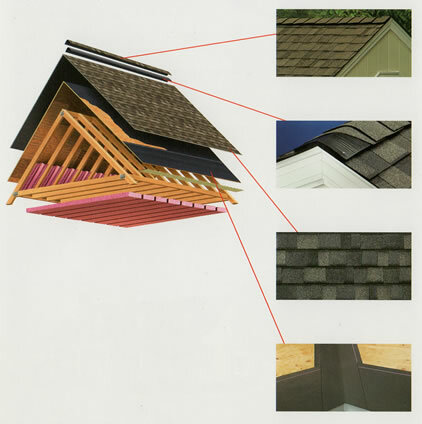 Asphalt shingles have been around for almost a century, so are well proven and reliable. They come in several profiles and a multitude of attractive natural colours. If slate or cedar would be your choice of roofs but is not within the build budget, then certain colour selections mimic that traditional look.